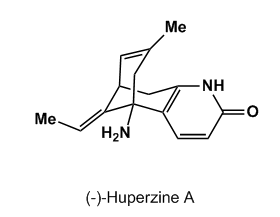 This time fresh work from the almighty Fukuyama group featuring a sweet compound with a really funny name: Huperzine A (at least in German it sounds funny…). And it owes an interesting biological profile: “it was found to exhibit a potent, selective and reversible inhibitory activity against acetylcholinesterase” which could be used as a treatment for Alzheimer’s disease. They planned to install the 2-hydroxy pyridine at least; the exo-ethylidene then arises from vinyllithium addition and “alcohol” transposition. 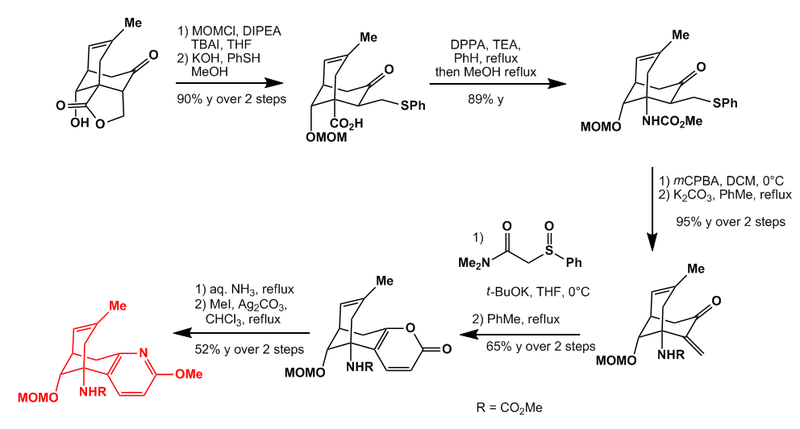 A Curtius rearrangement and a nice acid catalysed alkylation furnished the required intermediate. The commercially available anhydride shown was stereoselectively opened with benzyl alcohol in the presence of quinine following a procedure from Bolm. 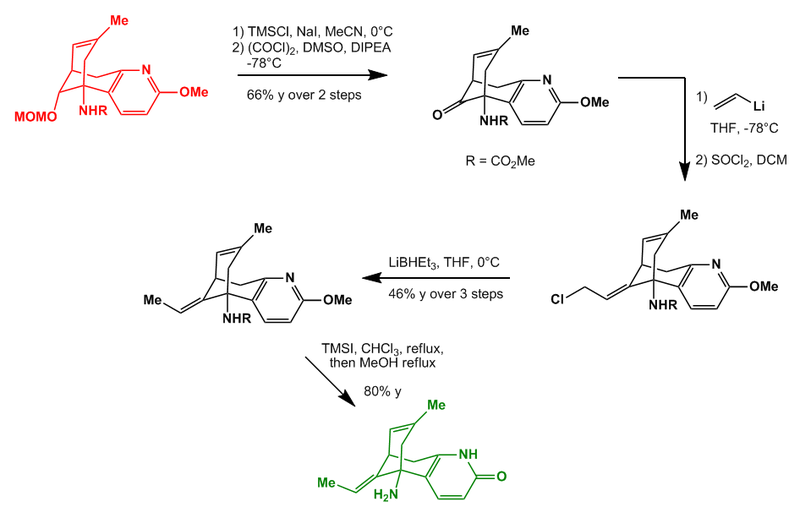 Chemoselective reduction and lactonization furnished one diastereoisomer in good yield with 93% ee. THF opening was followed by alkylation, alcohol directed epoxidation and Swern oxidation to give the blue fragment in high overall yield. 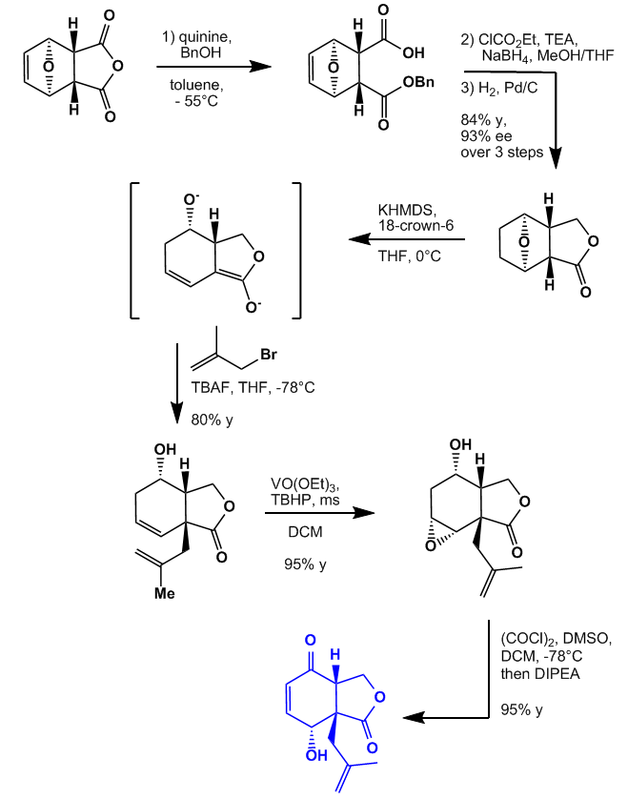 The blue fragment was then exposed to a catalytic amount of TfOH in DCM at low temperature to give the tricyclic lactone. The reaction was found by accident while trying to protect the alcohol as the TBS ether with TBSOTf which gave the product in low yield. After some screenings TfOH was identified to give the highest yields. MOM protection and base induced lactone opening with thiophenol set the stage for the Curtius rearrangement / carbamate protection (nice cascade which I did by myself but I had some problems with the purification). Oxidation to the sulfone and elimination gave an exo-methylene group which was used as a Michael acceptor for the sulfinylacetamide which cyclised to the pyrone at reflux in toluene. Amminolysis and methylation furnished the red intermediate. MOM deprotection and another Swern gave the required ketone which was exposed to vinyllithium followed by thionylchloride yielding the allylchloride shown. 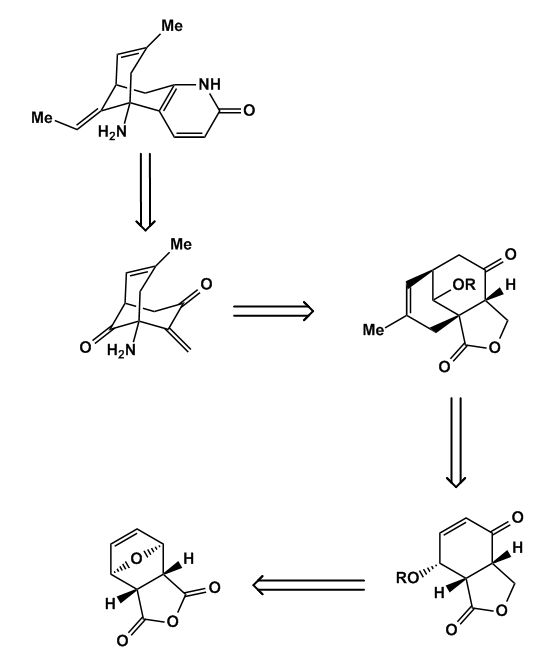 This was reductively removed with LiBHEt3 and after global deprotection with TMSI in MeOH the synthesis was done. Some sweet chemistry in here especially the acid catalysed alkylation and the exo-ethylidene synthesis are my favourites. Can you explain use of Ethyl Cloracetete in 2nd step at 1st synthetic scheme. Is it just for esterification or what? It’s to make the mixed anhydride, which in turn gets reduced in the presence of the benzyl ester. Pretty clever if you ask me. yep, think so too… while thinking about it: any one knows an alternative, without using some kind of mixed anhydride or acid chloride/ester? After checking out a handful of the articles on your site, I truly appreciate your way of blogging.